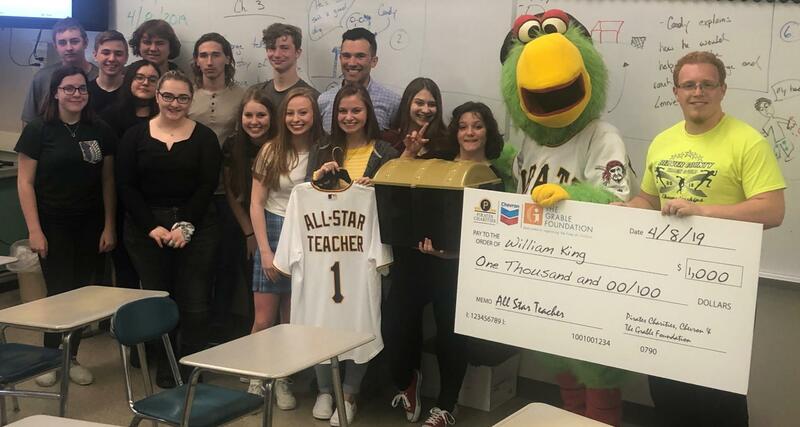 Congratulations to Mr. Bill King for being selected as a Pittsburgh Pirate All-Star Teacher. Mr. King, nominated by one of his students, was one of only 12 teachers throughout western Pennsylvania given this honor. In a surprise visit by the Pirate Parrot, he was awarded $1000 donation for use in his classroom, gifts for his students and a custom Pirate jersey. Also, on July 21st, Mr. King will be recognized on the field and will be invited to enjoy the game from a suite with his family!